recreational cross-country ski lessons and games for kids ages 4 to 13. Beginner Lessons – a two-hour group lesson to get you started skiing. Private Lessons are available on demand. weekly nighttpht skiing, full moon ski/socials, and more. Drop off and register your used equipment by October 13th at Algonquin Outfitters in downtown Huntsville during business hours (Thurs, Fri or Sat is best). 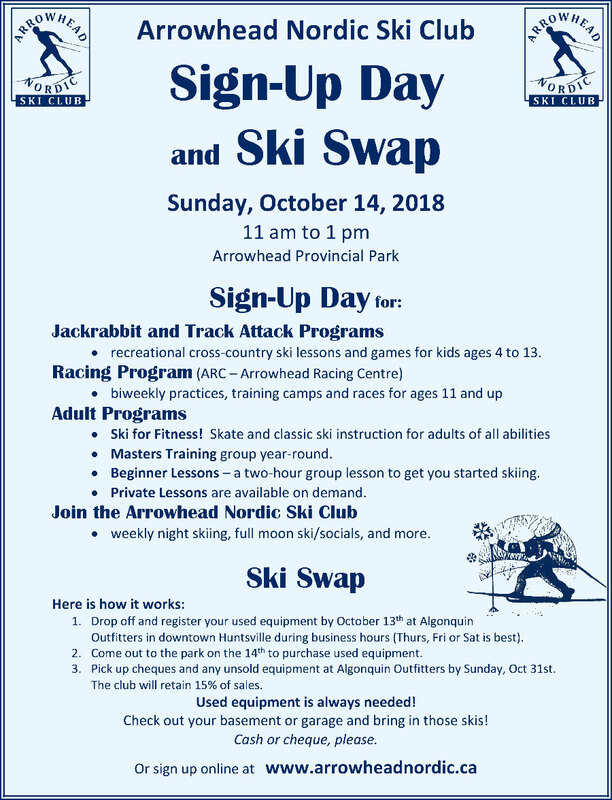 If your a business with lots of skis to drop off you can take them directly to Arrowhead Park, Saturday Oct 13th between 9am and 4pm call 1-705-787-0262 x24 for info. Come out to the park on the 14th to purchase used equipment. Pick up cheques and any unsold equipment at Algonquin Outfitters by Sunday, Oct 31st. The club will retain 15% of sales. Check out your basement or garage and bring in those skis! Cash or cheque, please.